Babies with cystic fibrosis may breathe better by inhaling hypertonic saline, according to a randomized controlled trial conducted in Germany and published in the American Thoracic Society’s American Journal of Respiratory and Critical Care Medicine. In “Preventive Inhalation of Hypertonic Saline in Infants with Cystic Fibrosis (PRESIS): A Randomized, Double-blind, Controlled Study,” Mirjam Stahl, MD, and co-authors describe a study of 40 young infants (average age three months at enrollment) with CF. The babies were randomly assigned to receive either hypertonic saline (saline with a six percent salt concentration) or isotonic (.9 percent) saline. They were followed for 12 months. Previous studies in mice found that the salt content of hypertonic saline decreased mucous plugging that can lead to airway obstruction and repeated infections. Other studies found hypertonic saline benefited older infants and children with CF. 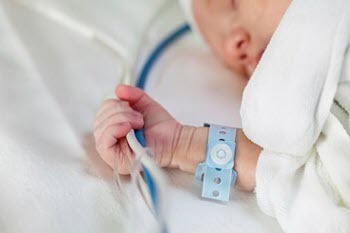 The researchers also tested whether lung clearance index and chest magnetic resonance imaging (MRI) could be safely performed on the infants and serve as quantitative outcome measures. Lung clearance index measures how well air is flowing through the lungs. Mucous obstruction of the smallest airways is one of the earliest features of CF lung disease, and lung clearance index can detect these changes in breathing. MRI can detect early abnormalities in lung structure. The authors report that both procedures could be safely performed in the infants and were well tolerated, though lung clearance index in this particular study provided a better yardstick to measure the benefits of this treatment. After one year, the infants who received the hypertonic saline had a better lung clearance index. Furthermore, they gained significantly more weight (500 grams or 1.1 pounds higher mean weight after one year of treatment) and height (1.5 centimeters or just under an inch higher mean height after one year of treatment). The weight gain confirmed previous studies of hypertonic saline in a mouse model for CF lung disease. Pulmonary exacerbation rates and adverse events between the treatment groups were similar. Study limitations include the fact that isotonic saline (sodium chloride concentration: .9 percent) is not a true placebo because it may, itself, have therapeutic benefits. The authors added that the infants were followed for only one year, so whether hypertonic saline therapy is beneficial over the long term is unknown. The study is believed to be the first randomized controlled trial in infants with CF.